First let's stop at the Catacombs! 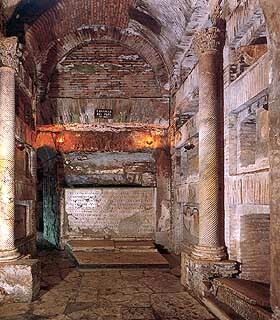 The catacombs of St. Callixtus are the ancient underground cemeteries . 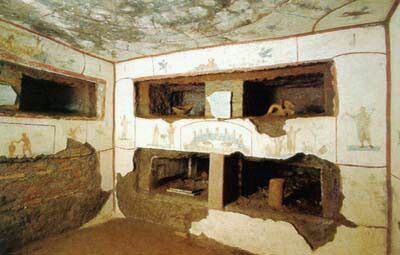 The catacombs began in the second century and the excavating continued until the first half of the fifth century. The catacombs are made up of underground tunnels in the form of a labyrinth, it occupies an area of 90 acres, with a network of galleries about 12 miles long, composed of four levels and more than twenty meters deep. 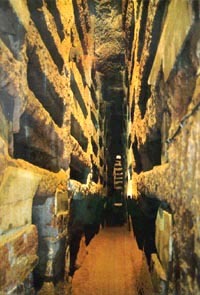 The tufa (a rock composed of compacted volcanic ash varying in size from fine sand to coarse gravel) walls of this intricate system of galleries were cut out rows of rectangular niches, called "loculi", of various dimensions, which could contain only one body, but not infrequently the remains of more than one person. 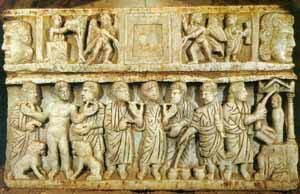 The burials of the early Christians were extremely poor and simple. The corpses, in imitation of Christ, were wrapped in a sheet or shroud and placed in the loculi without any kind of coffin. The loculi were closed with a slab of marble or, in most cases, by tiles fixed by mortar. On the tombstone the name of the deceased was sometimes engraved, along with a Christian symbol or a wish that the person might find peace in heaven. Oil lamps and small vases containing perfumes would often be placed beside the tombs. Rows of rectangular niches, called "loculi"
Now empty, once contained the remains of 9 Popes and 8 Bishops of the 3rd century. Family tombs, commonly known as the cubicles of the Sacraments, and particularly important for their frescoes. The frescoes can be dated to the beginning of the III century and represent symbolically the sacraments of Baptism and of the Eucharist (The sacrament of the Lord's Supper). We find depicted also the prophet Jona, a symbol of resurrection. 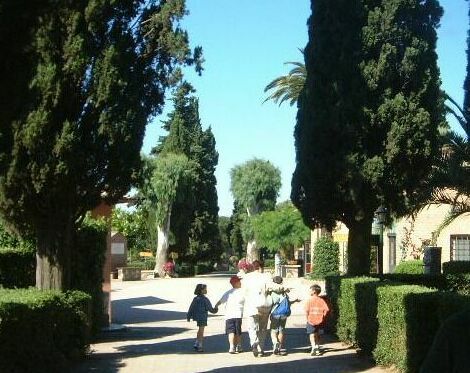 The outside of the catacombs-The kids were not allowed inside so our tour guide entertained them while we were discovering the catacombs. 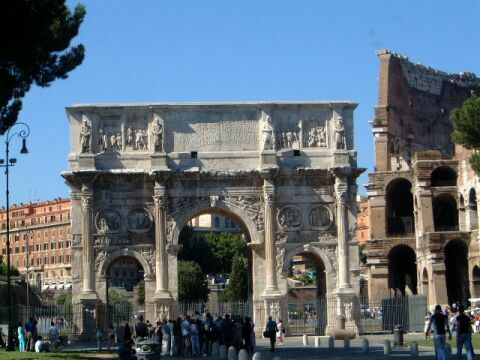 The Arch of Constantine (312 A.D.) in Rome is the largest of the remaining Roman arches. 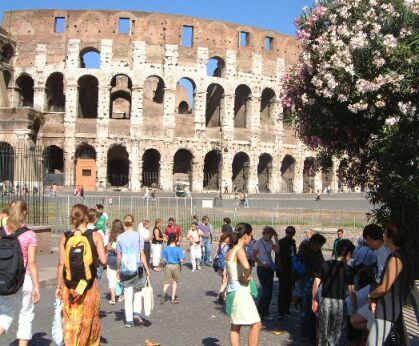 The Arch of Constantine is situated between the Colosseum and the Palatine Hill. 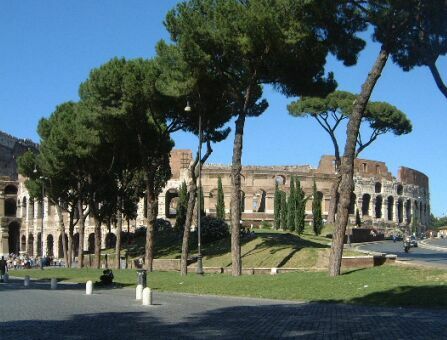 It was erected to commemorate Constantine's victory. 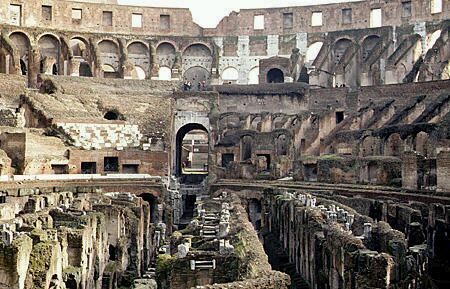 Collapsed floor of the Coliseum. Once it was able to accommodate 50,000 spectators. Roman roads ran to every corner of the Roman empire. Well built, stone-covered roads laid on proper foundations. The Romans learn early on that in order to control their territories they needed easy access to them. Wherever there was reliable roads, trade prospered (and brought in taxes). 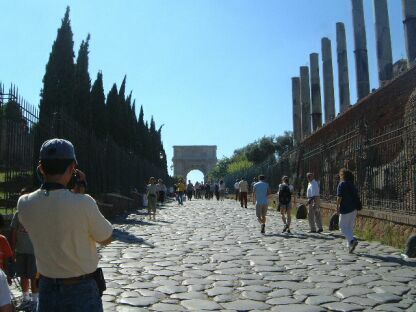 Sooner all towns and cities of the empire were connected by an elaborate road system, which meant that from any place within the empire you could travel to Rome by road, leading to the famous phrase: "All roads lead to Rome". Victor Emmanuel II Monument in Rome was built between 1885 and 1911. 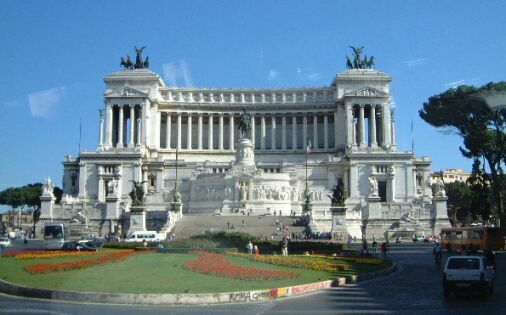 The monument was built in honor of Victor Emmanuel, the first king of Italy. The monument is very large and you can see it from the roof of St. Peter's. 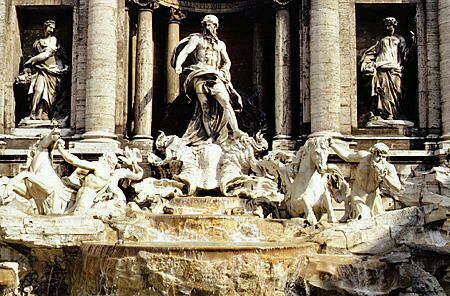 It has white columns in the background with large porticos on each side and a carriage with horses showing the triumph of victory of unified Italy. In the center is the king himself, with fountain in front of him and lots of steps to get to the statue. If you get a chance to walk along one of the porticos on the outside, look up and at good lighting you will see frescoes all the way at the top. You can only look at the monument from the bottom of the steps, nobody is allowed inside. The best shots can be taken from across the street, but it is extremely difficult to take a picture so that the whole monument fits into one shot. 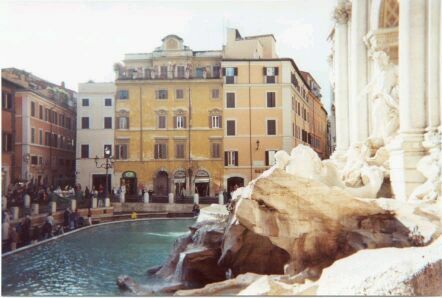 Legend says that if you toss a coin into the fountain over your shoulder, you will one day return to the eternal city. 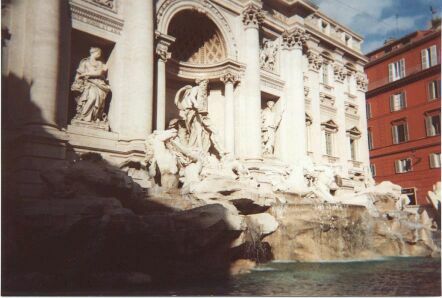 The fountain of Trevi is the largest fountain of the city. A scene of Ocean Kingdom with sea god, Neptune and horses. 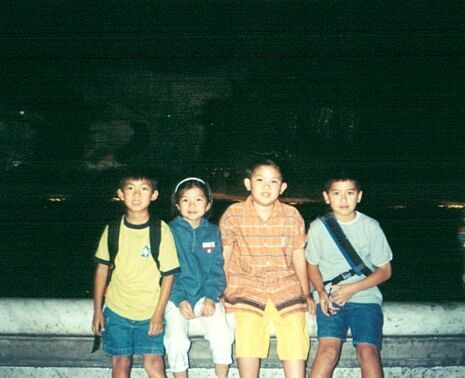 The kids hanging around the fountain.